It is time again for Holmen’s Hope Chili Cook-off Fundraiser! Come on down and taste them all and vote for your favorite! 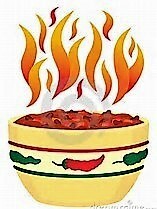 Or do you have a secret family chili recipe that you think will win the prize? Our celebrity panel of judges will determine 1st, 2nd and 3rd prize for the big money and the public will determine the peoples choice award for supreme bragging rights of best chili in Holmen. This event will be from Noon to 3:00pm, or until the chili is gone. Tickets at the door are $8 for adults, $3 for kids 7-12 and kids under 7 are free. Drinks are available for purchase. There will also be a silent auction and fun raffles going on. All proceeds will be collected for the benefit of Holmen’s Hope. If you think you have the best Chili recipe and want to be a contestant, print out the rules and entry form and send it on in. Don’t delay, as the number of entries are limited and filling up fast! If you have any questions you can contact Bob Buck at 608-769-2232 or email at bob.buck@vonbuck.com.